The C22 Michael Walker with carbon fiber handles was first introduced in 1994. In 1996 a Lightweight variation was introduced, initially denoted as C37 Michael Walker Lightweight, this variation's SKU was changed to C22BK in 2000. In late 1997 the CX06 Experimental 6 batch of the Michael Walker design was produced, featuring black almite coated aluminum handles. In a 2005 Sprint run another variation with blue almite coated aluminum handles was produced. The Michael Walker C22. A Spyderco, Michael Walker, HP Klotzli collaboration. Early 90's. First production carbon fiber handle. Only Swiss made production Spyderco. Custom made phosphure bronze pivot. The Carbon fiber came from the Sauber F1 race team. The knife was built for us by HP Klotzli. My wife, Gail carries one as an EDC. use carbon fiber and he worked with Michael to develop manufacturing methods. I worked with Michael on the design. Michael is quite a genius. developed the carbon fiber and titanium mfg methods. HP does great work. beautiful larger version by incrementally extending the pattern. A total of 1165 C22CF were produced. The exact numbers per edge grind type cannot be determined anymore. 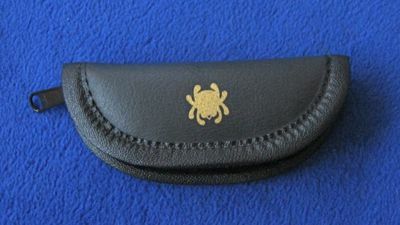 The Spyderco order consisted of 500x PE and 500x PS. Klotzli delivered knives with "naked" blades to Spyderco. Spyderco did the engravings and numbering on the blades. Glossy vs. matte carbon handles: Spyderco's quality demands were high. Initially only perfect carbon handles with the glossy surface were accepted. That resulted in more than 50% wastage with the carbon. Klotzli then started matting the carbon handles, so that fine scratches (that were unavoidable during production) disappeared. 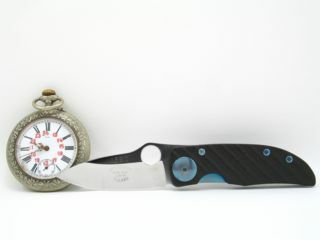 "Klotzli" vs. "Swiss made" engravings on the blade: Initially it was agreed that all three names should appear on the blade: Spyderco, Walker, Klotzli. At some point Spyderco stopped putting Klotzli on the blade (and used "Swiss made" instead). The Klotzlis are not in possession of the drawing by Bea Klotzli of the larger version of the C22. The C22 features a Walker Liner Lock and a spear point shaped blade. Earlier produced C22s with CF have glossy (shiny, polished) handles and later ones matte. There are also two types of engravings on the blade: The "Klötzli" put on earlier blades was later replaced by "Swiss Made". There also exist C22CF blades with lasered names and number instead of engraved (in the [1500,1699] range?). C22s with an engraved number in the 1700-1799 range have been reported. All other C22 variations (incl. CX06) were made in Seki-City, Japan. C22BK Black FRN PE PS AUS-8 1996-2000 64.95$ before 2000: C37 N/A Hollow Integral FRN RH, ? The low numbered early ones or the later ones are believed to be the most collectible variations, although one might say all C22's are collectible for several reasons as listed above! This page was last modified on 29 April 2015, at 05:51.